UPDATE: The petition to stop Brexit has surged past 2.75 million, the biggest volume of signatories ever for a government epetition since Theresa May called for just a short stay for Brexit and blamed MPs for the impasse. 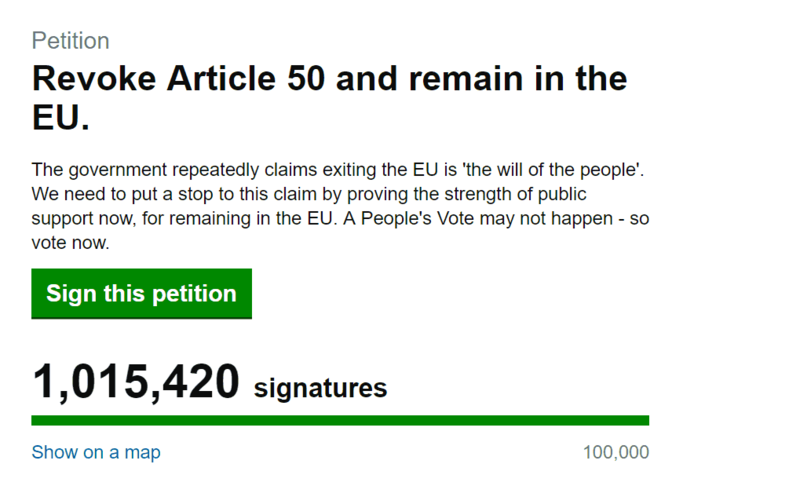 A petition to revoke Article 50 has hit one million signatures and is rising by the second. The petition was posted a few weeks ago but after last night’s performance by Theresa May, signatures have leapt up so fast you can see them increasing by the thousand. At one point, the petitions committee said there were nearly two thousand signatures a minute. The website crashed has several times today due to the huge amount of people who want to register their displeaure at Brexit and the PM’s deal to withdraw from the EU. Click here to sign or watch the numbers fly up. The government responds to all petitions that get more than 10,000 signatures and parliament considers all petitions that get more than 100,000 signatures for a debate.